A Glimpse into our Annual Summer Kids Camp! ~ The Toronto Hare Krishna Temple! A Glimpse into our Annual Summer Kids Camp! This year from August 4 - 7, 2015, we held our annual Summer Kids Camp! Lots of games and activities kept all the children engaged and squealing throughout the week. Please check out the slideshow below! 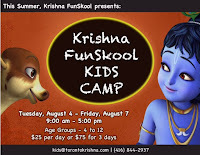 The Krishna FunSkool (Sunday evening weekly classes conducted at the temple) has a new session starting on Sunday, September 13 for children 4-12 years. For more information and registration, please contact kids@torontokrishna.com.